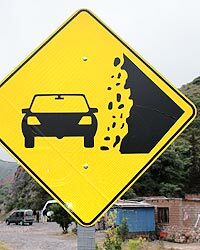 Falling Rock Signs with vehicles are typical for the New World and widespread in Latin-American countries. We've found them (e.g.) in Mexico, Chile and Guatemala but it's in Argentina that cars are drawn with the most precision. 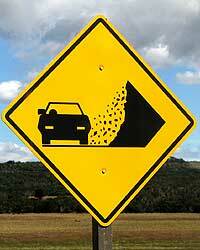 The number of boulders varies widely, from 7 to 42, as many as in Ecuador and only beaten by the Philippines with 45. The car is often shown equipped with a rear-view mirror and back-lights and a driver is at the wheel. Even the differential is sometimes shown! I'm a bit unsure about the driver. The first car features a person but this is far less sure with the other two. If what we see at the driver's position is a head (which is unnaturally inflated) then the person (center) is far too short and probably unable to drive safely. Are we looking then at the top of a seat? Not likely because in that case we should see two spheres. Is it the wheel? But then we should see through the center. And the car would be without a driver. 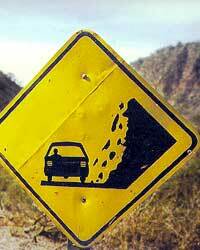 Which means that it is parked in a rock-slide area! Definitely not a good example. Take a look at the lights. The last car carries only one at each side, down from three ! We are on the way towards a simpler car without any (or perhaps only optional) lights. Once again a clear case where cost is more of a concern than safety. Notice also that the third car is equipped with new technology: it is a hovercar. 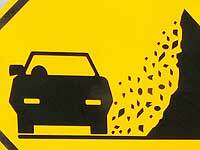 The system is a huge cost saver because it reduces the wear of both tyres and roads. Now, this is most refreshing. 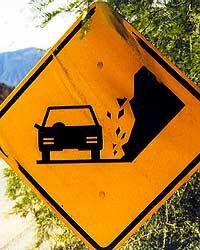 A revolution in road signage. Do you see what has happened? Take your time. I'll wait. 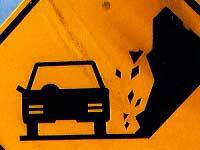 Falling Rock Signs if they feature a vehicle, show it from behind. Otherwise the roadsigns on this page wouldn't fit the situation in Argentina. The same holds true in any other country (e.g. the U.S.A., Chile, Ecuador). This find, however, shows a car coming towards us. The front is shown with striking headlights. But wait. There is something weird. 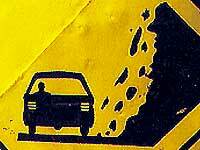 It would mean that the car is approaching on the wrong side —our side— of the road. I'm not ready to believe that. I'll rather accept that the vehicle carries oversized tail lights and that this find is mainstream after all.